The Foxcroft Academy wrestling team poses for a photo after winning the Penobscot Valley Conference championship on Saturday at Piscataquis Community High School in Guilford. 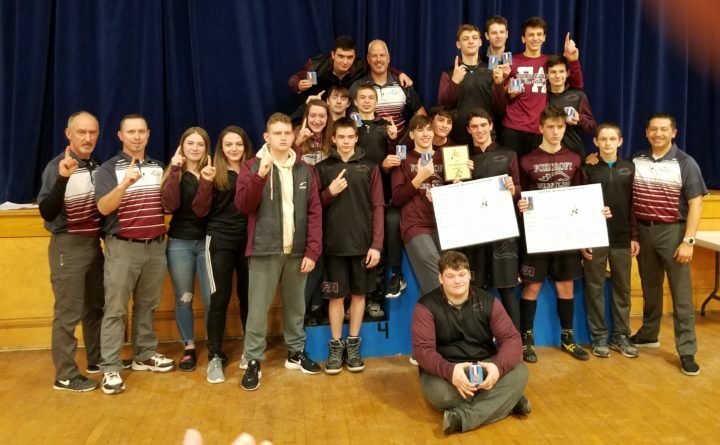 Foxcroft Academy scored top-four finishes in 11 of the 14 weight classes Saturday to capture its fourth straight regional wrestling championship by winning the Class B North meet held at Ellsworth High School. Coach Luis Ayala’s Ponies scored 169.5 points, nearly the exact total they had when amassing 169 points in winning last week’s Penobscot Valley Conference championship. Dexter finished second with 148.5 points, with Mattanawcook Academy of Lincoln (103), Piscataquis Community High School of Guilford (100) and Bucksport (96.5) rounding out the top five. Belfast was next with 95 points, followed by Ellsworth (71), John Bapst of Bangor (42), Fort Kent (41.5), Washington Academy of East Machias (27), Penobscot Valley of Howland (25), Calais (23), Bangor Christian (22), Caribou (19), Mount Desert Island of Bar Harbor (14), Lee Academy (5) and Sumner of East Sullivan (no score). Foxcroft crowned two individual regional champions in Dustin Simmons at 160 pounds and Lucas Ames at 195, with Rico Ayala placing second at 120 pounds. The Ponies also went 5-3 in consolation finals, with Grady Reardon (126), Jacob Ireland (145), A.J. Atkinson (152), Sam Robinson (170) and Jared Atkinson (285) all earning third-place finishes, while Sawyer McCarty (106), Austin Jackson (113) and Josh Tatlock (138) each placed fourth. Dexter also had two individual winners in Caleb Weeks at 132 pounds and Gage Stone at 152, while five Tigers finished second in their weight classes: Justin Wing (138), Nathan Schobel (145), Isaiah Hesseltine (160), Gus Irwin (170) and Eric Bennett (220). Mattanawcook Academy and Piscataquis also had two individual champions apiece. Mattanawcook Academy won in the two lightest weight classes, with Deegan Tisdell earning the 106-pound title and Jackson Sutherland triumphant at 113. Travis Mushero’s second-place finish at 132 pounds helped the Lynx to their third-place performance. Other individual champions were Landon St. Peter of John Bapst at 120 pounds, Oakley Dugans of Bangor Christian (126), Logan Lord of Ellsworth (138), Josiah Brown of Washington Academy (182), Cameron Watts of Belfast (220) and David Gross of Bucksport (285). The Class B state meet is set for next Saturday at Mattanawcook Academy.